Looking at their fullness [chEthanas], there is no way that they would reach hell. AzhwAr wonders as to why they seek exception and fall into hell. In the earlier pAsuram he advised that we should worship emperumAn well. For that to happen, we should be there [alive] in the first instance. thAm uLarE… – emperumAn has already created chEthanas, giving them physical forms and sensory perceptions. vishNu thathvam says “vichithrA dhEha sampaththi: ISvarAya nevEdhithum, pUrvamEva kruthA brahman hasthapAdhAdhi samyuthA” (Oh brAhmaNa! The physical body, with hands and legs, has been created in the beginning to be offered to emperumAn). Thus, emperumAn has already given the physical form to chEthanas. They do not have to create themselves. tham uLLam uL uLadhE – once their existence has been granted, without the need for searching out for a heart, he has given that also, and has made it, his. Heart is not something that is outside of oneself. In order to hold on to the readily accessible, righteous emperumAn, the readily available heart is sufficient. Despite these, is it difficult to worship emperumAn? thAmariyin pU uLadhE – The lotus flower is available! Even if he does not want, these have been created already so that he does not have to seek anything outside. emperumAn has removed all his short falls, so that the chEthana does not have to search out for the flower. The lotus flower is not outside his possessions! Eththum pozhudhu uNdE – The time required to hold on to emerpumAn is also there without any shortfall. Even if one feels lazy to pluck a flower, emperumAn has created sufficient time for worship! vAman thirumaruvu thAL maruvu senniyarE – [for the sake of poetic metrics] vAmanan has been shortened to vAman. Isn’t vAmanan willing to come even as a mendicant in order to accept whatever the chEthana gives! He has created the head [for the chEthana] so that the chEthana can bow his head at the divine feet of emperumAn. The divine feet manifest the opulence of emperumAn. 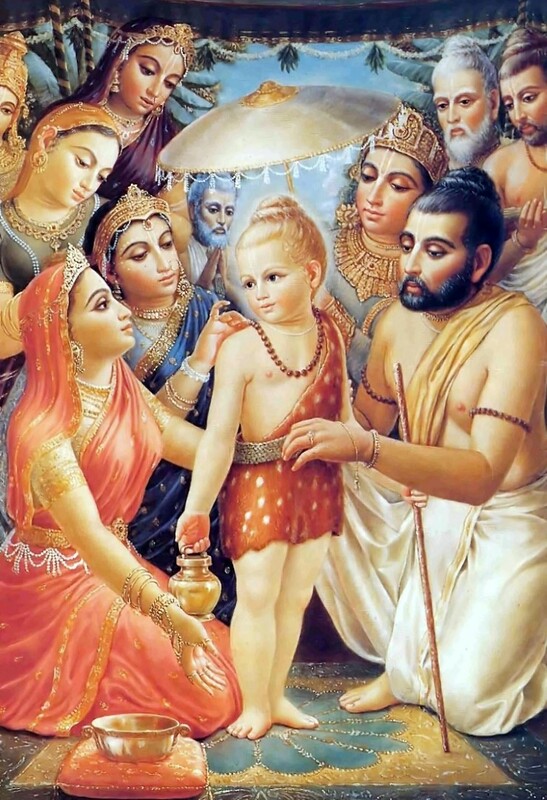 vAman – isn’t he one who is elated, keeping his divine feet on everyone’s head and is willing to come even as a mendicant in order to reclaim his possession! All that is required of us is to hold on to him (he doesn’t expect anything else). thirumaruvu thAL – As mentioned in sthOthra rathnam 31 “Sanka chakra rathAnga kalpaka dhvajAravindhAnkuSa vajra lAnchanam” (divine feet which have as their identity the following: conch, disc, kaRpaka tree (wish fulfilling tree), lotus flag, goad, vajrAyudham (a weapon like a mace, made of diamond)) his divine feet are such that they manifest clearly that he is the Lord. Hasn‘t periyAzhwAr too divinely mentioned the same in his periyAzhwAr thirumozhi 5-4-7 “thiruppolindha sEvadi” (his divine feet manifest opulence)! maruvu senniyarE – emperumAn had already created the head which manifests the chEthana’s servitorship! Aren’t they (chEthanas) those with heads which will accept when emperumAn keeps his divine feet on them! “nAn” (I) denotes egoistic state like that of rAvaNa. “aham” (servitor) denotes the humble state like that of vibhIshaNa. sevvE arunaragam sErvadhu aridhu – to go directly to the cruel samsAram (life in the materialistic realm) is very difficult. When such is the difficulty, how do these people go, searching for samsAram? When emperumAn has given so many implements [physical form, senses, lotus flower, time, head etc] there is no scope for going to hell (Yet these people waste all these implements and take births in samsAram repeatedly, AzhwAr says mercifully, with sadness). arunaragam – those who do not have knowledge will consider the dwelling place of yama as hell. Those with knowledge will consider taking birth in this word itself as hell. sIthAppirAtti says in SrI rAmAyaNam ayOdhyA kANdam 30-18 “nirayO yasthvayA vinA” (being separated from you is hell). Hasn’t SrIvishNu purANam 17-63 said “dhEhE chEth prIthimAn mUda: bavithA narakEpi sa:” (that ignorant person will have desire for his physical form even in hell)! Instead, to one who does not have it (desire for his body), there is no scope for going to hell. We shall move on to the 22nd pAsuram next. This entry was posted in iraNdAm thiruvandhAdhi, iyaRpA on October 21, 2017 by T N Krishnan.